1x Knight of Shrouds on Ethereal Steed. 1x Guardian of Souls. 5x Glaivewraith Stalkers. 4x Grimghast Reapers. 1x set of Nighthaunt Warscroll Cards. 1x set of Nighthaunt Endless Spells. Warhammer Age of Sigmar Nighthaunt Chainrasp Horde for sale! Includes: 10x Chainrasp Models are new on sprue and include the bases. One weapon has broken off of one model. Weapon is lost and not included. 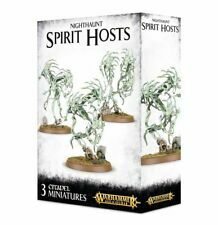 Includes all models from the Night Haunt army, bases, and assembly guide. This multi-part plastic kit contains the components necessary to assemble 10 Bladegheist Revenants. Each is posed swooping and jinking unpredictably; the chains that bind them to Shyish are swinging wildly about their forms. This multi-part plastic kit contains the components necessary to assemble 10 Dreadscythe Harridans. Particularly horrible and tragic even for Nighthaunt, They are tortured and twisted forms, rising as ethereal spirits whose emaciated arms peek out from beneath their cowls. Nighthaunts: Chainrasp Champion Dreadwarden Bits ( you will get: all the parts needed to make 1 chainrasp dreadwarden w/ optional non-champion front & 25mm slotted base, as shown ). Leave us a negative and you'll be blocked. 2nd picture shows the 9 styles of which you will get one, you will NOT get everything shown in that picture. If you buy multiples we will try to pull different styles but duplicates are possible and more likely at lower inventory levels. Nighthaunts: Grimghast Reaper Champion Exrtoller of Shyish Bits ( you will get: all the parts needed to make 1 grimghast reaper extoller w/ 32mm slotted base, as shown ). Leave us a negative and you'll be blocked. This multi-part plastic boxed set contains 91 components with which to make 5 Hexwraiths, wielding spectral scythes. One model can be assembled as a Hellwraith, leader of the unit. This multi-part plastic kit contains the components necessary to assemble Liekeron the Executioner, a Nighthaunt Lord-Executioner. Looming large over a ruined headstone, Liekeron is depicted as a sinister, hunched spirit, half corporeal and half ethereal, whose skull-like face is picked out beneath a ragged cowl. Now, in undeath, the Grimhailer is cursed to serve the Great Necromancer, acting as his chief reaper of souls. Reikenor the Grimhailer is an impressively aggressive-looking and sinister Nighthaunt miniature. 2nd picture shows the 5 styles of which you will get one, you will NOT get everything shown in that picture. If you buy multiples we will try to pull different styles but duplicates are possible and more likely at lower inventory levels. 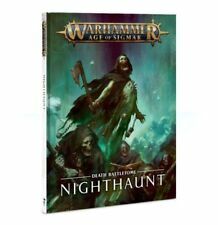 Up for sale is one Nighthaunt Age of Sigmar lot (20 Chainrasps, 5 Hexwraith, 4 Glavewraith Stalkers). Condition is Used. Warhammer Underworlds Nighthaunt warband – the Thorns of the Briarqueen. 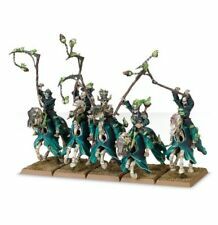 This buy it now is for the Nighthaunt warband – the Thorns of the Briarqueen Warband. It is painted and comes with all 7 models, all 20 ploy cards for thrones of the Briarqueen and 13 objective cards 3 are universal objective cards and 9 are Thorne of the Briarqueen specific. If you have any questions please email me. This includes a single Knight of Shrouds on Ethereal Steed model, 1 slotted 75mm base, Warscroll card, and assembly instructions; everything pictured. This was removed from a new Soul Wars Box set, it has never been used. This is my painted Mortis Engine. 2nd picture shows the 3 styles of which you will get one, you will NOT get everything shown in that picture. If you buy multiples we will try to pull different styles but duplicates are possible and more likely at lower inventory levels. Contained within Both of these warbands are Easy To Build, with no glue necessary and a comprehensive, easy to follow construction guide;. 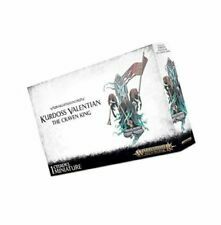 - 2 pre-built decks of power and objective cards – 96 in total – for use with the included warbands;. Limited Edition Warhammer Age of Sigmar - Darrakar Guardian of Souls . Can be equipped with several different options as shown on the box. This model is only available at the anniversary of an official Warhammer store. The model is brand new in box, still shrink wrapped. Please let me know if you have any questions. Warhammer Age of Sigmar Nighthaunt Lady Olynder - New - Free Shipping! She is the Mourning Bride, the Unrequited Queen, the Veiled Lady and the Mortarch of Grief. She is despair made manifest, gloom given form. She is Lady Olynder, and in her are bound all the sorrows and anguishes of the realms. Warhammer Age of Sigmar Nighthaunt Grimghast Reapers - New - Free Shipping! Like clockwork, they endlessly repeat their deadly shearing strikes. They seem to start and stop, travelling in convulsive bursts; but they are fast for all that. 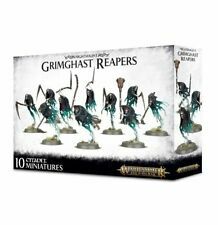 This multi-part plastic kit contains the components necessary to build 10 Grimghast Reapers.